Ebook – "Expertise, Right Across the Board"
The conformal coating production line, whether it is an operator manually brush coating printed circuit boards (PCBs) or an inline robotic spray coating process is typically made up of several stages. This is very straightforward. The PCBs are delivered to the conformal coating area ready for processing. Inspecting the circuit boards before starting the conformal coating application process starts helps avoid stopping the line if there is a problem. The initial inspection process can also identify which PCBs are to be coated, the material to be used and how they are to be coated. This can be done automatically as part of the production process or completed by the operator. Cleaning the circuit boards before application of conformal coating may or may not be required. This is a decision that should be made earlier on in the design stage before production actually starts. Ensure that the cleaning process does not add more contaminants to the PCB than it started with due to entrapment of cleaning fluids. 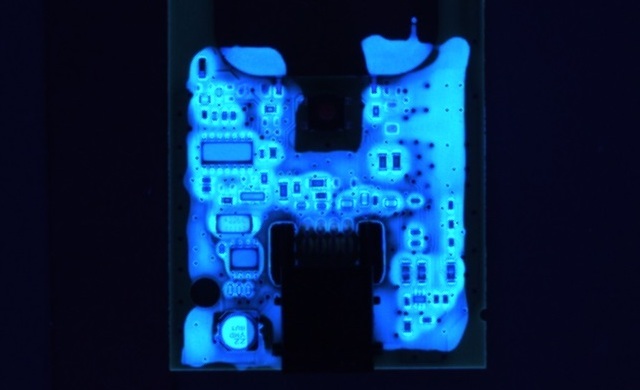 Make sure the PCBs are dry enough for the conformal coating process and the cleaning process not leave water entrapped under components that could impede the application. Ensure the cleaning process actually removes residues that may cause defects like de-wetting to minimise finishing at the end of the process. Again, cleaning is for the engineers to decide. The option of whether you need to clean your circuit boards for conformal coating is a whole topic on its own. Masking may not be required on the circuit board. However, generally there are very few circuit board assemblies that can be completely coated and have no areas that must not be conformal coated. Some components on PCBs generally need to avoid having conformal coating applied to them. You can avoid coating the component or area using a selective application process. You can apply some form of masking that the conformal coating can be applied to and remove the masking materials after application. You can apply a conformal coating that does not need masking against. Again, engineers need to consider their options on whether to use conformal coating masking as soon as possible. Generally, it is more efficient to double check the masking process is correct before conformal coating application rather than repair the PCB after the process goes wrong because the masking process was incorrect. This check can be manual or automated but it is highly valuable. The one stage that cannot be avoided is the conformal coating applied to the PCB. There are many different methods for applying conformal coatings and probably the most important factor in all of them is training. The operator needs to understand the process to be able to work correctly. A conformal coating is a wet process (unless you use Parylene) and therefore the coating has to dry. The difference between drying and curing in conformal coating is very different. However the process required depends on the conformal coating itself. Care needs to be taken in deciding how to achieve the right result. Like masking, there is skill in removing the masking materials from the circuit board and not damaging the coating. This is also where touch up (finishing) is carried out to ensure the final finished PCB is fit to pass the inspection criteria. Work instructions are needed along with training on the specific methods of finishing to ensure this can be achieved. Again, the work environment can be critical to achieve the right results. When the PCB is conformal coated and finished, you need to know if the product meets the inspection criteria. 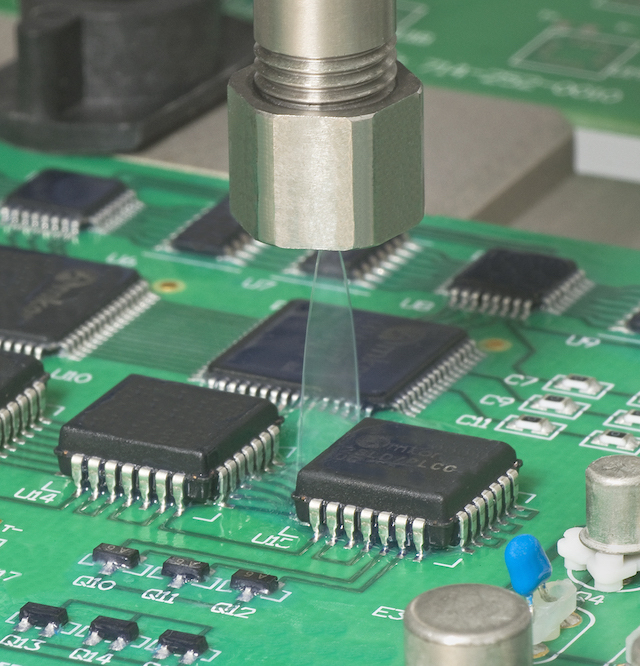 The conformal coating inspection process can be done manually or automatically. This can depend on the volume of PCBs and the level of sophistication required. Again, it is down to operator training and using the right equipment to ensure that this is possible. Also, at this stage it is possible to measure process factors like coating conformal thickness to check that the criteria are met. Any coating facility will need the basic requirements put in place that would be standard for any piece of electronic manufacturing process. These include ESD systems, facilities for the machines, the environmental requirements and the normal Health & Safety (HSE) considerations. Conformal coatings are sensitive to the environment that they are processed. Cleanliness could be critical, as can temperature and humidity. Setting up a conformal coating production facility can be a straightforward process as long as all factors are considered. Get this right and many of the problems that could occur during production will be avoided. Click conformal coating production processes for further information or contact us directly and we can help you. How do I selective apply my conformal coating without using masking? 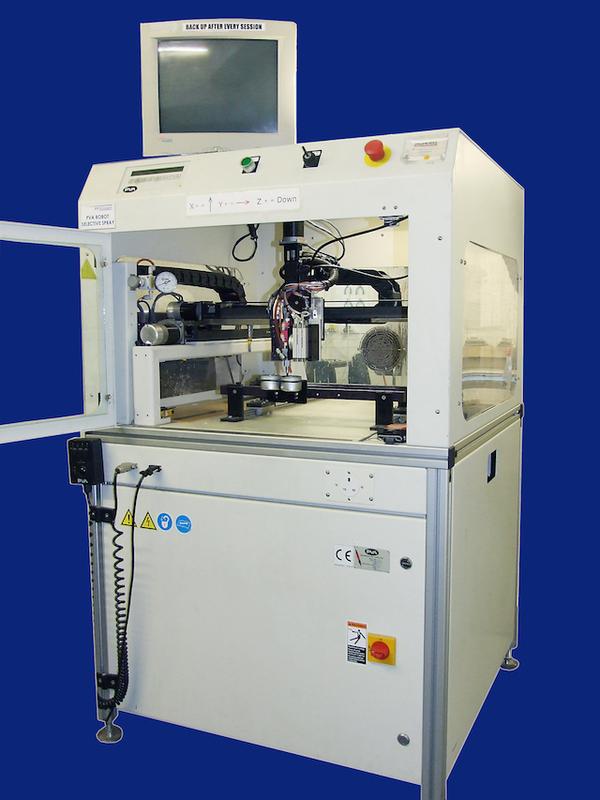 Selective spraying of conformal coating using an automated robot system is one of the widest used application methods in high volume processing. The principle is that the conformal coating is applied selectively by a small spray gun to the circuit board to the areas requiring coating only. The selective process deliberately does not apply the conformal coating to areas that normally require masking such as connectors and other components. This selective application of the conformal coating to the circuit board can avoid using a time consuming masking process and costs can normally be reduced. The robotic system will be fitted with various conformal coating spray valves that apply the different types of conformal coating material to the circuit board using different spray patterns. Want to find out more about application of conformal coatings to circuit boards by selective robots? What specialist valves are required for applying different types of conformal coating? Go directly to our conformal coating selective spray application section or contact us directly and we can help you. Images 1 and 2 courtesy of PVA (Precision Valve Automation). Author nexus3cPosted on June 20, 2017 Categories Blogs, conformal coating, conformalcoating101, Consultancy, Ebook, How To GuidesTags Coatings, conformal coating, nexus, selective coatingsLeave a comment on How do I selective apply my conformal coating without using masking? The measurement of the conformal coating thickness on a printed circuit board (PCB) to ensure internal and international standards are met is now a standard process in production. There are several methods for measurement of conformal coating thickness including dry and wet film processing. However, the most important factor is how thick should the coating be? First, you can reference both internal and international standards like IPC A 610 for conformal coating application. They can help a lot. These standards will help guide you in the coating thickness required for a particular coating materials since the coating thickness suggested will be dependent on the resin of the conformal coating. For example, an acrylic or polyurethane based conformal coating has a different coating thickness requirement to silicone-based materials. Note, that this is the average thickness across the circuit board. It is almost impossible to achieve a homogeneous coating thickness with the liquid conformal coatings due to surface tension issues during drying. Using this information you can now move forward and look at the application of the conformal coating. For further information on process control and conformal coating thickness then contact us directly. Author nexus3cPosted on March 29, 2017 March 29, 2017 Categories Ask The Experts, Blogs, Ebook, UncategorizedTags coating, conformal coating, nexus, positector, thicknessLeave a comment on How thick should I apply my conformal coating? Why use a conformal coating to protect a circuit board? A fundamental question asked quite often is why do I need to coat? After all, it costs money and it can be difficult to process. Not very attractive to use it! However, there are several reasons why a traditional liquid conformal coating or Parylene could be used to protect a printed circuit board (PCB). To find out more about these reasons read our section why use a conformal coating? Author nexus3cPosted on June 22, 2016 June 20, 2016 Categories conformalcoating101, EbookTags conformal coating, why use a conformal coating?Leave a comment on Why use a conformal coating to protect a circuit board? How do I select a conformal coating? I am regularly asked how I would go about choosing a conformal coating? I normally respond to the person involved by asking an awful lot of questions and they wonder what they got themselves in to! Why do I have to ask a lot of questions? The questions are there because choosing a conformal coating process is a complicated process usually balancing a lot of important trade-offs and compromises. When I consider the question I actually see three major parts of the complete process. When you consider these three points you have to balance them to create the best compromise process solution that suits your requirements. This is what I call the Holistic Approach to conformal coating. It is tempting to consider one of these parts in isolation. However, this could be a mistake. After all, the wrong choice can be devastating to the conformal coating production process as a whole and even worse, the reliability of your product. I feel that to identify the best conformal coating material and application process there are several key factors that you need to consider that, if you are lucky, will add up to at least one sensible process choice. To find out more about these factors visit Nexus and see how we recommend you select a conformal coating through the holistic approach. Author nexus3cPosted on June 21, 2016 June 20, 2016 Categories conformalcoating101, Ebook, ProcessTags choice, choosing, conformal coating, control, holistic approach, process, selectionLeave a comment on How do I select a conformal coating? Where to start in Nexus? 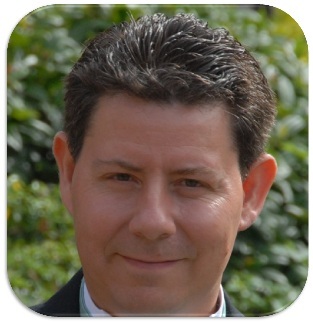 My name is Dr Lee Hitchens and I am the author of the Nexus conformal coating website and eBook. If you’re reading this blog then the chances are you are looking for a piece of information on some area of conformal coating and this is exactly what Nexus was written for. Nexus is an independent website and eBook dedicated to providing information on all areas of conformal coating and the related topics connected to the process. This includes Parylene and other deposition processes, fluoropolymer technologies plus the traditional conformal coating materials. I have been working in the area of conformal coatings and electronics high reliability for over 25 years in various areas including sales and technical support. I have also been training people in all areas of conformal coating for almost the same amount of time. A few years ago I decided that people needed a specific place where they could find all of the useful knowledge on conformal coatings and use in their own production process. So, Nexus was created and I began writing the website. I explain a little more here on why I wrote Nexus? This year I decided to re-launch Nexus and create an online eBook. The major difference with the new site was that the information added was all peer reviewed. That is people from all over the industry are helping with the quality of the content and helping peer review the information. This is so the conformal coating knowledge you have from Nexus is as independent as it can ever be and should be able to guide you through most issues without risk of commercial bias. I hope that you find it the case and the information you find is useful. So where to start with Nexus? If you are new to Nexus then a good place to go is our Start Here page. When people visit our site they go to certain areas. I have tried to indicate these pages directly and help you save some time. Finally, this is a continuous project and I am always looking to improve the content. If you need anything specific then let me know and I will be more than happy to help out. Author nexus3cPosted on June 20, 2016 June 20, 2016 Categories EbookTags conformal coating, why write NexusLeave a comment on Where to start in Nexus? Unfortunately, for too many designers, conformal coating is simply a part number to apply to printed circuit boards. For manufacturers embracing lean philosophies and applying conformal coatings, a failure to appreciate the subtleties of the application process can result in an un-coatable (at least as specified) assembly process. Nexus have split the conformal coating Design Rules into 4 sections. The design rules for conformal coating are generally straightforward. Follow them and you can save money and time in your application process. However, if the rules are not followed, the resultant circuit board design can challenge even the most sophisticated conformal coating system and its operator to achieve the finish desired.